SunDiao Brand usb flash drive, cool design , easy to read in high speed and no need drive supply only plug in. It¡¯s also a good idea of gifts for kids, just add to your cart and buy now ! Note: before you use the usb drive, please format it in the first time. 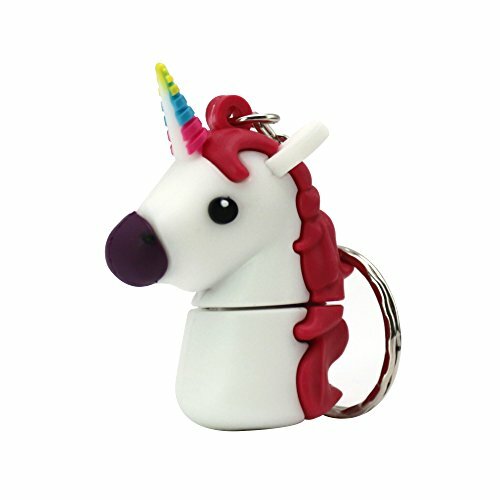 ★ Special design ★ fun and lovely shape makes it easy to distinguish with other people's USB flash drive, creative unicorn shape to use more fun! It is a lovely and amazing gift to your friends or family. ★ Elaborate production ★ made of high quality silicone material, soft and durable, small size, cute style, fashion. Comes with a key chain, it can and keys, backpacks, wallet, etc. in one, easy to carry and use. ★ Data security ★ Use A-level chip, stable and reliable performance, at least 10 years of data retention time and up to 1,000,000 times more than the repeated erase operation. Anti-magnetic, earthquake, moisture, high and low temperature resistance. ★ Excellent performance ★ USB 2.0 interface compatible with USB 1.1, plug and play, no need to drive / power, in line with high-speed USB 2.0 specification, data transmission speed, low power consumption. Store and share your photos, videos and music in a simple and reliable way. ★ Wide compatibility ★ can be used in a full range of Windowns system, Linux system and Mac OS system, support with USB2.0 port desktop, laptop, tablet PC, TV and audio and other equipment, USB flash drive In our lives is indispensable. If you have any questions about this product by SunDiao, contact us by completing and submitting the form below. If you are looking for a specif part number, please include it with your message.